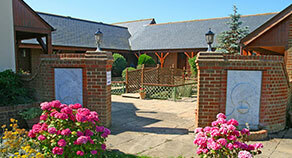 Chale Bay Farm is located in the village of Chale with uninterrupted sea views towards the Needles and Tennyson Down. Chale Bay Farm is right on the Isle of Wight coastal path and at about the half way point for those walking right around the Island. There are also many other good shorter walks nearby including up to the nearby "Pepperpot" and Hoy Monument on St Catherine's Down, as well as towards the lighthouse at St Catherine's. Blackgang Chine is just 2 minutes from Chale Bay Farm by car and at more than 170 years old is probably the World's oldest theme park. Visit the magical theme worlds: Cowboy Town, Pirate Cove, Fairy Land, Fantasy Land and Nursery Land, experience the Waterforce water slide or take a thrilling spin on the cliff-edge rollercoaster as well as the spectacular Restricted Area 5 with huge, life-size animatronic dinosaurs as well as more visits from their baby T-Rex's Shadow and Sheila. 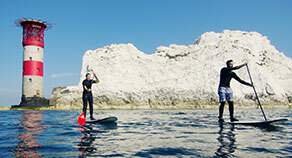 For grown-ups visit the exhibition on coastal erosion, the historic whale bones dating back to the early days of the park and the 'World of Timber' exhibition which features woodland & countryside crafts; plus the 'Wight Experience' cinema which delivers a 15 minute film of a helicopter trip over the Island showing the amazing coastline. Further along St Catherine’s Down is the Hoy Monument, built by Michael Hoy in 1814 to commemorate the visit of the Tsar of Russia to Great Britain. A later plaque erected on the bottom of the pedestal in 1857 was to commemorate soldiers killed in the Crimea. The Parish Church of St Andrew was founded by Hugh Gendon in 1114, while the present church structure dates from the 14th century. The Church has some impressive stained glass windows and six bells in the tower. Just a few minutes walk from Chale Bay Farm is the Butterfly Paragliding Club where they cater for both newbies and experienced paragliders. The largest forest on the Isle of Wight is just along the Military Road at Brighstone.